Glitter card for magical effects on your cards. ...for a sparkling finish to your designs. For a magical effect...try glitter card. 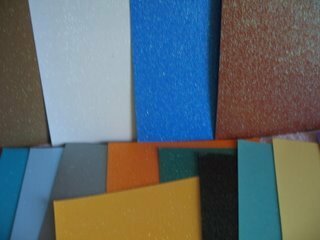 This is a material that I love to use on my cards. It has such a special effect and comes in a rainbow of colors. Each of the side panels in this card are done in a matching shade, with the tags added to the top. Yep! been there..done that!! Not good! Cut it into shapes in your die cutting machine, trim off a strip to add as a border to your designs or use it to Mat and Layer your images. The thing to remember is the type of glue you use to stick things to it. The best glue I have found, which will stick anything to anything, is "Pinflair Glue Gel". It is fabulous stuff and will hold all your embellishments to the glitter. 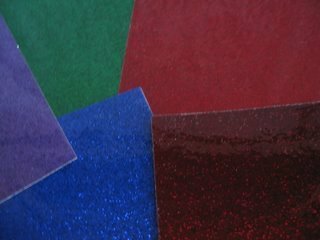 Another type to consider is the Encapsulated card, and this is when the glitter itself is embedded in a top film to stop any loss at all. It is usually more expensive, but it is easy to work with. Don't be afraid to play and see which type and colors you like best. Mix and match with other patterned papers for an effect that is truly stunning. And if you buy some, and the glitter falls off ...you will know not to buy that brand again....coz a bald card does not look right some how! !